Hi Science Cheerleader fans! Hilary here, introducing you to New England Patriots Cheerleaders rookie Samantha! 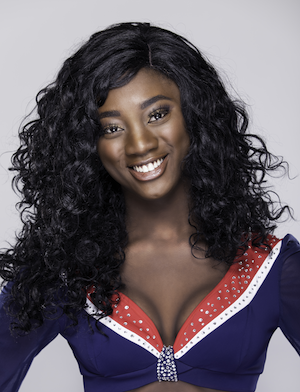 When she isn’t preparing for the Super Bowl, Samantha is studying to get her bachelor’s degree in biomedical science! What turned you on to STEM and when? When I was eight years old, my father bought me a children’s book called Freddie Visits the Doctor. After reading the book every night before bed, the idea of becoming a doctor seemed more interesting by the day. Growing up I have always excelled in my science classes, so my fascination with becoming a doctor became stronger and led me to apply to college as a biomedical science major. Why did you try out to be a cheerleader? Growing up, I danced for about nine years on a competitive dance team. I have always loved being a part of a team because it taught me so much about myself and how to work with others. What is your day job like? As an undergraduate teaching assistant for general biology and microbiology labs, my job is quite busy. I spend the majority of the week grading lab reports, which are pretty much a summary of what the students did in lab that week and what they learned from it. I also create slide shows to teach my students. When I am not grading lab reports or creating lesson plans, I am preparing the lab with all the supplies needed to have it run smoothly. What does it mean for you to be studying STEM? Although I am not quite there yet, my career goal is to become a pharmacist. I love knowing that I am part of the mechanism to help people feel better. I love the idea of being able to have direct patient care with the people who come to my pharmacy and making a difference in their lives. Every day there are new advances in medical technology, which is one of the many reasons why I love the idea of becoming a pharmacist. I can use those advances to select the best medicines and treat diseases earlier on or prevent them entirely with individually tailored drug therapies. How do you feel about breaking down negative stereotypes about cheerleaders? I am very passionate about breaking stereotypes about not only cheerleaders in STEM, but also women in general. “Science is not feminine, men are worth more, you can’t be a mom and a scientist,” are some of the most common stereotypes that are out there about women in STEM, and they are just simply untrue. When I got into college as a biomedical science major, most of my peers were shocked. I was always known as the girly dancer and pageant model that knew how to walk in heels, and no one would have ever guessed that I loved math and chemistry. Throughout most of high school and college, I was always asked if I was going to drop out because I loved participating in pageants and modeling as a hobby. Best science/health-related experience? At my university, I hold a board position for Project Sunshine. Project Sunshine is a national-level nonprofit organization that provides free educational, recreational, and social programs to children and families living with medical challenges. My role in the organization is that I get students involved by fundraising and performing biweekly hospital trips. My best health-related experience was when I met a young boy who had been in the hospital for over ten years. Before I went into the room, his father had stopped me and said that he had reached a plateau and just stopped communicating with everyone and just would not speak. He had asked me to just try to get him interested in whatever activity I had planned for that day. I kept trying to get the young boy to speak to me or act interested but it just wasn’t happening. When I began to get discouraged he finally asked me to take him to the game room and play PlayStation with him. After my visit, the young boy thanked me and told me he hoped to see me again soon. His father told me that I was the first person that he had spoken to in months and that he was very thankful for my visit. What advice would you give your 12-year-old self? I would tell myself not to care what others think and to do what truly makes you happy. I always had self-esteem issues to the point where I wouldn’t do something without other people’s approval because I was so afraid that I would be judged or people would make fun of me. When I finally realized that what other people thought of me didn’t matter, I became much happier as a person and noticed that I started making stronger relationships with not only my friends but my family as well.